Please note that the Church halls will not be in use between January 6th and 10th 2014 and all meetings have been cancelled. Due to ongoing work on our water pipes the heating is unlikely to be on during that week. Update: This work has been completed on schedule. The December 2013 newsletter is now available from our missionary partner Jenny Featherstone in Zambia. The Brownies and Rainbows are having a Christmas Coffee Evening with stalls and entertainment on Wednesday 11th December from 6.15pm until 8pm. All are welcome to attend. The December 2013 newsletter has been published and is now available on the Newsletters page. The Kirkcaldy Foodbank will be launched on 2nd December and is now collecting suitable foodstuffs to share with those in our community who are experiencing a food crisis at this time. If anyone wishes to donate food items from the list (available in the Methven Hall), they can be brought to Church on Sunday mornings or from 10.30am to 12 noon on a Thursday when the Olive Branch Café is open. The Walkers will have some fun and jolliness around the parish on Sunday 8th December before engaging in our now annual craft session, followed by a Christmas curry provided by Mary & Joseph – Stark that is. If you’re thinking of your New Year resolution why not join the Walking Group? The Flower List for 2014 is now available in the vestibule. If you wish to provide flowers for the Sanctuary, please add your name to the Sunday(s) of your choice. The Service on Sunday 8th December is our GIFT SERVICE to support the work of the Salvation Army in Kirkcaldy. Please bring a gift or a toy for a child up to 15 years old (new and unwrapped) for distribution to the needy in the district. Please, no clothes. If you wish to have a poinsettia in the Church for a friend or in memory of a loved one, please put your name on the Poinsettia List in the vestibule of the Church by Sunday 1st December. These plants will decorate the Church on Sundays 15 and 22 December. After the Service on Sunday 22 December you can take the plants home. The cost of a plant is £5 and they are large plants. A total of 114 boxes from the church and 40 boxes from Dunnikier School were uplifted on Thursday and then transported to Templehall Church, the pick-up point for Kirkcaldy area, where 800 boxes were received. Children from Valley School joined in a short service along with adults, before the boxes were loaded onto the lorry and then on their way to Glasgow to be checked before going to Moldova for distribution. The journey in a huge lorry takes one week and on arrival the boxes will be arranged into different groups for adults, elderly people and children, all of whom live in poverty or low-income groups. Filling a shoe box or giving a donation is a great way of showing kindness to a stranger in need - thank you for being part of it and to all those who helped in any way to make the Shoe Box Appeal 2013 such a success. You will bring a smile to someone at Christmas. Our next Songs of Praise service will be on Sunday 24th November. Request slips are available in the Order of Service sheet provided at all November services. All we ask is that if you are requesting a song/hymn that you say a few words as to why you have chosen it. If anyone would like to order Pray Now for 2014 at a discount price please see the notice board for information or speak to Robin or George Drummond. The Christmas Fayre is on Saturday 9th November from 2pm until 4pm in the Methven Hall. Please come along and support Bennochy Church, enjoy afternoon tea and do some Christmas shopping. Tea tickets are on sale now and cost £2, or can be bought at the fayre. The stalls available on the day comprise Soft Goods, Baking, Body Products, Bric-a-Brac, Jewellery, Tombola, Jams, Jellies, Plants, and a Raffle. All donations for stalls will be gratefully received and can be delivered to the hall on Friday from 2pm until 4pm and on Saturday from 10am until noon. UPDATE: The total raised at the Fayre was £2, 079. Thanks to everyone who worked so hard and everyone who supported the Fayre and helped to raise this magnificent amount. Our Girl Guides could do with some extra help. They meet on a Wednesday night from 7pm to 8.30pm. If anyone would like to help or knows of anyone who might be interested please speak to any office bearer or go along on a Wednesday night. Due to the success of the Olive Branch Café, we are finding that we need a larger pool of volunteers to assist on café days or occasional Wednesdays to bake or make soup. We already have a valuable volunteer force pulling together to deliver a good standard of service and good quality food, but a few more willing hands would ease the workload. You don't need a particular talent to join our café teams, just a desire to help make the project successful. 9am to 10.15am: To set up tables, chairs and equipment once every four weeks. 1.30pm to 2.45pm: To tidy up once every four weeks. 10am to 2pm: For general kitchen/café duties once every four weeks. Two hours approx once per month on Wednesdays to bake/make soup for 16 people in the Church kitchen. Orders are now being taken for our jigsaw. It contains 315 pieces (400 x 280mm) and costs £12.50. Please contact George Drummond to place your order. An ideal Christmas gift! This years Alpha Omega course, has been postponed until next spring. If you are interested, please speak to Robin for further details. The Christmas Fayre will be held on Saturday 9 November from 2pm until 4pm in the Methven Hall. As this is one of our two main fund raising events for this year, your support will be very much appreciated. There will be all the usual stalls, and donations for the stalls will be very much appreciated. The Hall will be open on Friday 8 November from 2pm to 4pm and again on Saturday 9 November from 10 am for the receipts of items for all the stalls. Helpers are always required. Anyone wishing to help at the Fayre, please contact Senga Booth (890972). The October 2013 newsletter has been published and is now available on the Newsletters page. The Women’s Group are hosting a Family Quiz Night on Saturday 26th October at 6.30 pm. Tickets, £4 adults & £2 children, available from Group members. Come along and enjoy a fun night for all the family with prizes, raffle & dessert supper. Our annual Gift Day is on Saturday 19th October from 10am until 12 noon. Come along to the Methven Hall to make your donation and enjoy a chat over a cup of tea/coffee. If you can’t manage on Saturday you can bring your contribution in an envelope marked "Gift Day" any Sunday or give it to your elder. UPDATE: The amount raised to date is £2,550 including £425 recoverable for tax. The Finance Team is very grateful for your continued support in sustaining and developing our ministry at Bennochy Church. It is never too late to give. If you still wish to contribute, please put your donation in the offering plate in an envelope marked "Gift Day" when next at Church, or hand it to the Treasurer or your District Elder. Harvest Sunday's Special offering to help offset the cost of fees for a carpentry student at Choma College where Jenny Featherstone, our Missionary Partner is Principal, amounted to £383.50. UPDATE: Jenny sends her very grateful thanks for our contribution to the work of Chodart College in Choma, Zambia. This sum of money will cover the fees for a student in the Carpentry Course 2014, Jan.-December, also the cost of a Dust Coat while working, also exam fees at end of year, with other small costs included. 2013 marks the 20th anniversary of the shoe box appeal, which has raised 1.6 million gift filled boxes since it began. Filling a shoe box is a great way of showing kindness to a stranger in need and your generous and thoughtful gifts bring happiness to so many people in Europe and Asia. You are invited to fill a shoe box again this year and you can be sure that your gift will make someone happy. Covered shoe boxes will be available as from Sunday 29th September and if you intend to fill one then please take your box as soon as possible - the information leaflets are inside. Please bring your filled shoe box to church preferably on 3rd November but if this is not suitable then 10th November (Remembrance Sunday) will do. The boxes are being uplifted from the Church on Thursday 14th November. Our Community café got off to a very good start on Thursday thanks to the great support from members of the congregation and our team of volunteers. There were quite a few new faces and we’re hoping that these numbers will increase as word spreads. Feedback (!) on the menu was very positive. The team has been overwhelmed by the generous donations by members of the congregation of food, ingredients and a range of items – very many thanks. If you didn’t manage along last week, we’d be delighted to see you this Thursday and if you did come, please pop in again! The Guild 2013/14 session starts this Tuesday, 17th September at 2 p.m. when the speaker will be Rev Robin McAlpine. New members made most welcome. This years Harvest Thanksgiving Service will be held on Sunday 22nd September. Once again we will collect non-perishable goods (packets or tins only) for the work of the Salvation Army (donations welcome) and an offering will be taken during the service to help offset the cost of fees for a carpentry student at Choma college, where Jenny Featherstone, our missionary partner, is principle. The Church will be decorated on Friday 20th September from 2pm. Anyone willing to assist with the decoration is welcome to come along at 2pm. The East Fife Ladies Choir will be performing a concert in the Church on Friday, 27th September at 7.15pm. This concert is in aid of the Kirkcaldy branch of the Samaritans. Tickets, £5, are available from Grace Morrison or pay at the door. The opening day of our new community café, The Olive Branch, will be Thursday 12th September at 10.30am. This will be run by volunteers and offer tea, coffee, biscuits, soup and bread with all meals freshly made in the Church kitchen. View the opening day poster with sample menu. The café will be open from 10.30am until 1.30pm each Thursday. A Fun and games day with a barbecue is being held in the church gardens on Saturday 24th August. This free event for the local community will start at 2pm. It’s a day for all ages, so come along and join in the fun. If it rains the event will take place in the Methven Hall. All welcome. The July 2013 newsletter is now available from our missionary partner Jenny Featherstone in Zambia. Jo Jingles is a new group starting in the Methven Hall on Wednesday 21st August. This organisation runs music, singing & movement classes for children aged 3 months to 4 years with the main aim for children have fun... lots and lots of fun! The EMMS Bike & Hike is an annual sponsored event around churches in the district to support the work of EMMS International in Malawi, Nepal and India and also raise funds for our own church. If anyone wishes to take part or would be willing to man the church for a few hours on Sunday 7th September, anytime between 10am and 6pm, please speak to George Drummond. The Walkers next walk is on Sunday 11th August leaving from the Church at 12.45am to visit Auchtermuchty and enjoy a lovely 4.5 mile walk. It is the last day of Muchty Festival so be prepared to join in the open air ceilidh. Refreshments at Tranquility Cafe, Freuchie. All are welcome. The Walkers next walk is on Sunday 21st July leaving from the car park opposite Link town at 12.45pm. We'll car share to Thornton and park at the station. Our walk will be a circular to Milton and Coaltown of Balgonie & return stopping at the Balgonie Arms for our usual refreshments. This is a flat 7 mile walk and as always, all are welcome. The June 2013 newsletter has been published and is now available on the Newsletters page. Children and young people are always especially welcome at these Summer services. Please note that there will be no service at Bennochy Church on the Sundays where the joint service is held elsewhere. The service at St. Bryce Kirk will feature a Baptism whilst the Linktown service will be accompanied by a Brass Ensemble. Members of Bennochy Church who require transport to any of the joint services should contact George Drummond or any office bearer on duty. The Kirkcaldy Branch of the RNLI is holding a concert in Bennochy Parish Church on Saturday 29th June at 7.30 p.m. by the Inverkeithing Community Big Band. This band plays a selection of various types of music. Tickets, price £6, can be had from Grace Morrison over the next few Sundays. The set of Handbells will, by now, be back in the Church, after repair and restoration work at Whitechapel Foundry. Bell Ringers are to meet on Tuesday, 28th May, 6 p.m. and thereafter for a few weeks until a summer break. A welcome to anyone interested. Bethany Christian Trust are organising two local events - a quiz night at the Victoria Hotel at 6.45 p.m. on Wednesday May 29th and a clothes swap at their Kirkcaldy shop on Monday June 10th. Contact Andrew Stothard for more details, Tel: 07436151206. Thank you all very much for distributing and collecting the envelopes within the parish and beyond. The weather was certainly very mixed with rain, sunshine, thunder and lightening - and also huge hailstones on Wednesday in some parts of the town! Thank you again for all your hard work for such a good cause. This gives a grant total of £4279.01 for Christian Aid. Many thanks to all who took part this year as we have exceeded the total for 2012. We have received an open invitation to the official re-opening and dedication of the former St. Andrew's Church, as Redemption House, Redeemed Christian Church of God, Open Heavens, Fife, to take place on Saturday 8th June at 2pm. The May 2013 newsletter is now available from our missionary partner Jenny Featherstone in Zambia. The Guild are holding a Fish Supper Night on Monday 27th May at 7pm in the Elgin Hall. Please contact Wilma Wright if you plan to attend so as to confirm numbers. The Get-Together are meeting in the Victoria Hotel on Thursday 30th May at 5pm for High Tea. Anyone wishing to attend please contact Helen Lundie. Instead of a Christian Aid Soup and Sweet Lunch this year there will be a Coffee, Cake and Candy Afternoon on Friday, 24th May from 2-4 p.m. Tickets are priced at £3. Anyone willing to help in any way please meet in the Meldrum Room, (Crèche Room) on Sunday 12th May, after the service. Everyone welcome. Our theme on Sunday 12th May will be Christian Aid Week - “Bite back at Hunger”. This will be the start of Christian Aid Week (12th - 18th May) and inside your Order of Service will be a red Christian Aid envelope should you wish to donate to Christian Aid. A separate offering will be taken during the service for the filled envelopes. Thank you. The Walkers next walk is on Sunday 12th May leaving from the Church at 1pm. This walk is a circular from Lochore Meadows to Cardenden and return. Approx 7 miles with 2 steep gradients and mud - more a ramble than a walk. Stout footwear and walking poles recommended. As always, all are welcome. St Columba's Parish Church, Glenrothes, are holding a Coffee Afternoon on Saturday 11th May from 2pm to 4pm. Tickets are £2.50 and all are welcome. A Presbytery wide Songs of Praise Service will follow at the same venue on Sunday 12th at 7pm. 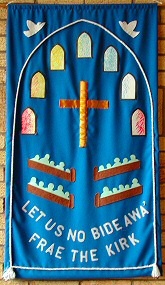 The Presbytery Prayer Banner is reaching the end of its pilgrimage around the congregations in our Presbytery and the Mission and Worship Committee is organising this service to celebrate its journey. There will be lots of favourite hymns and readings, with an address by the Moderator of presbytery, Rev Tony Fowler, Templehall church. All are welcome. A Scones and Sponges Afternoon Tea will be held in the Methven Hall on Friday 26 April from 2pm to 4pm with all proceeds going to Samaritans Kirkcaldy and District who celebrated 40 years of service in 2010. Some time ago we were contacted by the Samaritans asking us to assist them to raise the money necessary for the development of their building to meet the needs of the Branch. The sum of money required is enormous, and the prospect of the task daunting. Their hope is if they receive a lot of a little, then, just maybe, the seemingly impossible becomes a reality. They realise this is a difficult time financially for a lot of people, but they will appreciate anything we can do to help. Our support will be very much appreciated. Tickets are on sale now from Kirk Session members. UPDATE: A letter has been received from the Samaritans Kirkcaldy & District thanking us very much for the generous donation of £607.15 to their Building Fund. They are honoured to be the beneficiaries. The Women's Group are holding a Bunny Drive in the Methven Hall on Tuesday 9th April at 6.30pm. Bring along family and friends to an event that all ages can enjoy. Tickets - adults £4 and children £2 - from ladies of the group. A special Memorial Service will be held at 3 pm on Sunday 14th April which invites all family and friends connected with Bennochy Church, our parish or whose funeral has been conducted by our minister over the past year. All members of the congregation are welcome to attend. If you know of anyone else who would appreciate an invite please let Robin know. Bennochy is pleased to announce that we are now the host congregation for the Fife Deaf Church. They will be worshipping in our building on the last Sunday of the month at 3 p.m. with the 1st service being held on 31st March. The services are open to all, so come and worship with the Fife Deaf Church. The Guild Concert will be held on Monday 25th March at 7.15pm with entertainment by the East Fife Ladies Choir followed by refreshments. Tickets are £4 from members or pay at the door. As one of the ways of reaching out to the community in our parish, particularly those who may feel isolated or lonely, it is proposed that we in Bennochy Church open a lunch cafe serving simple lunches, teas and coffees, initially one day per week. A pilot of this project is currently being planned and we are appealing for volunteers from the congregation to assist with running the cafe along with volunteers from outwith the congregation. A short open meeting will be held immediately after the service on 24th March when the background to the project will be explained and how you can help to make it a success. It is a pleasure and a privilege to welcome our Mission Partner, Jenny Featherstone to our morning service on Sunday 17th March. This is one of many visits she is making during her stay in Scotland, from 15th to 25th March and this after a busy round of visits in England and abroad. Not always a restful furlough! We look forward to her news with great interest. You can read her latest Newsletter by clicking here. A Special Offering will be collected for Steadfast Global on Sunday 17th March - a Scottish voice for persecuted Christians. This Charity is based in Stornoway on the Isle of Lewis. The vision of Steadfast Global is simply to: "build a bridge between the Church in Scotland and persecuted Christians across the globe". They stand with the Suffering Church and ask us to stand with them. While prayer is undoubtedly their most important request, they also require financial support for forward planning and long term commitment. Our prayers and our financial support will therefore be very much appreciated. Fairtrade Fortnight will be held 25th February - 10th March 2013. Fairtrade promotes the principles and products of Fair Trade. Many of our local shops & supermarkets now sell Fairtrade Products. Fairtrade is all about improving trade for farmers in developing countries by ensuring they get better prices and good working conditions. Fairtrade helps improve their lives and prevents discrimination against poorer producers. Please look for the Fairtrade Logo, do your bit and take a simple step when buying your groceries by swapping your own brand for a Fairtrade brand. There will be a Fairtrade stall in the Methven Hall after the service on Sunday, 10th March when you will have the opportunity to purchase Fairtrade small gifts, sweets and some groceries. Please give your support. The February 2013 newsletter is now available from our missionary partner Jenny Featherstone in Zambia. Bruce Davies will be performing a musical concert at the Church on Saturday 2nd March at 7.30pm. With his acoustic six and twelve string guitars, rich baritone voice and an accessible style, he presents the songs of his heroes and friends, some of his own award-winning compositions and the best of Scotland’s song repertoire and in a programme that goes well beyond what is normally regarded as folk music. A concert not to be missed. Tickets, priced, £5 may be obtained from George Drummond or Bruce Davies. This years fundraising afternoon raised more than £1,300 for the RNLI Kirkcaldy Branch after a successful and busy Sponges and Scones event. Many thanks to all who came along. The March 2013 newsletter has been published and is now available on the Newsletters page. You can read more about this years World Day of Prayer in our March Newsletter. The Lent Studies Group has now started and is again being led by Rev McAlpine. All are welcome to come to all or some of the meetings. The group meets in the Prayer room on Mondays up to Easter (see event calendar for times). Each meeting will last between 60-90 minutes. Lent is what Christians call the six weeks that lead up to Easter, which is the most important festival in the Christian calendar. This is to symbolise the 40 days of when Jesus went into the desert to think, fast and pray before setting out on his journey to Jerusalem and his eventual Crucifixion and Resurrection. The congregation have been informed that the church building in Victoria Road, occupied by St. Andrew's Church prior to the union with St. John's Church in March 2010, has finally been sold. The purchasers, the Redeemed Christian Church of God, took possession of the building on Saturday, 9th February, one hundred and ten years after it was first opened as a Church. We are pleased to say that the Church will continue to be a place of worship and offer our best wishes to all who worship there in the future. We are sure they will be greatly blessed in the months and years ahead. The Walkers next walk is on Sunday 24th February leaving from the Church at 12.45pm. This will be a walk around Colinsburgh and is weather permitting. As always, all are welcome. Senga Booth, again with lots of help from friends in Bennochy Church, is holding the Annual Tea Afternoon - Sponges and Scones - in the Methven Hall from 2 p.m. to 4 p.m. on Friday 22nd February for the Royal National Lifeboat Institution SOS Day. The RNLI receives no government funding and all lifeboats are crewed by volunteers who do a great job rescuing people around the coast of Britain. This work is usually done in very treacherous conditions. The waters around the Firth of Forth are always very busy. Please come along and sample our scones and sponges (SOS). We will again be delighted to see you. There will also be a Cake and Candy Stall. Tickets are available now from Senga or Grace Morrison. All proceeds from the event will go to the Kirkcaldy Branch of the RNLI. The Round South truck accepts clothing, shoes, books & bric-a-brac etc. The lorry will be parked on the esplanade (car park next to the old bus garage) on Wednesday 23rd January from 10.45 - 11.30 a.m. if anyone wishes to donate goods. If you have any item not mentioned above the driver will give you advice on other goods that they might accept. The lorry comes every month and the next date will be 20th February at the same time and place. This is the same charity that we do the shoe boxes for at Christmas. The Taekwondo Club has launched its new schedule for 2013. New members will be most welcome, especially to join the Tiny Tigers who cater for Primary 1 and 2 pupils. Learn to kick and move just like the winners in the Olympic Games! Classes are held on Fridays for Tiny Tigers, Beginners and Blue/Advanced belts. On Sundays, all belt level classes are held along with Black belt sessions. The Special Offering on Christmas Eve amounted to £260.20, which has been divided equally between Aberlour Child Care Trust and Samaritans Kirkcaldy and District. Your generous support is very much appreciated at this time of year.